A favorite rainy day activity is reading a good book. Nikon D700/50mm, 1/60s, f/1.8, ISO 360, EV -0.6. Yesterday was a very rainy day. Dark clouds and down pours off and on all day made for a perfect day to curl up with a good book. In my case, the latest thriller from Dan Brown, The Lost Symbol. If you liked Dan Brown’s other books, you will enjoy this one, too. UPDATE: The rainfall in Syracuse, New York, yesterday was the second largest since 1950. See, I was not kidding. 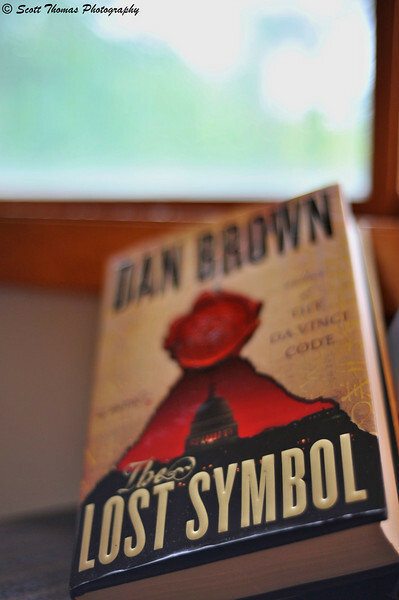 This entry was posted in Weekly View and tagged bokeh, book, dan brown, rain, rainy day, reading, relax, the lost symbol, window. Bookmark the permalink. I read that one too! Good book. Rainy day activities for me: reading, sorting through pictures, reading blog archives, playing silly games on Wii, and occasionally, sewing, if I have a quilt project going on. A nice assortment of fun things, Karen. Of course, you have a lot of sorting and processing of photos these days. I haven´t read this book either. I like the way you presented it. On a rainy day, my activities are a bit similar to Karma´s: reading, sorting through pictures, sewing and going out anyway. A Beagle does not mind rain at all and just needs his daily (twice) walks ! Yep, rainy yesterday and today. Oh, rainy days can mean a myriad of things for us! Sometimes, we are in the middle of a home improvement project, so that takes our attention; other times, we sit and watch good movies and suggle; sometimes, we make a huge ol’ pot of sauce or chicken stock (we LOVE to cook!). Sometimes, life’s errands call and we have to be out and about. You still write letters? Been ages since I have done that. I like your enjoy sweet idea very much. Ah, yes, a good time to read the camera manual. I have a long trip coming up where I will be studying my new camera’s manual from front to back. You’ll have to post a review after you finish the book! Oh, I finished the book. I was about half done but that had taken me a week. I don’t review fiction books as that is so subjective. If you liked his other books, you’ll like this one a lot. Interesting how reading or catching up on blogs is a favorite rainy day thing. I count that as an every day thing so I didn’t think to put it down. Scott, f/1.8 is new to me, very nice bokeh. Oh, Nye, you should look into getting a 50mm f/1.8 lens. They are a lot of fun to use and learn the power of bokeh! 😀 Cleaning is good. Scott, I kept thinking that it’s an extension tube but I guess not. A rainy day at home? I enjoy beeing with my family, reading a book or watching a good DVD. OR making a post on my blog – soon maybe to your latest assignment 😉 …! Great, Truels! Looking forward to what you come up. Watching a good movie or two or three would be a great way to spend a rainy day. The sound, smell and feel of a good rain is cleansing. Especially on the hot plains of Kansas. Thank you for reminding me of that aspect of a rainy day, Anna. I’m with you. A good book, my soft warm kitty, and a cup of tea suits me just fine. Actually, I love it most when it rains at night. The cadence of rain drops on the roof provides the perfect backdrop for a good night’s sleep. Regarding the rainfall, Sunday was the first time since the big storm on 6/14/02, when we had all that flooding everywhere, that we had a minor leak in the house. I don’t even remember the other two storms; how weird is that? Meanwhile, interesting perspective on this shot of the book; very neat indeed.